Is it time for a Website Tuneup? If your site isn’t as effective as it could be, but developing a new site isn’t realistic, there is an answer — a review of your current site followed by recommendations that can be quickly implemented without requiring major programming changes. That’s the idea behind our Website Tuneup. We can review and refine content on your site so it communicates with more clarity and impact, improves visitors’ experiences, and increases SEO ranking for the people you want to reach. What’s included in a Website Tuneup? The Website Tuneup is focused in three areas: copy, visuals, and SEO. You can choose any or all three. You can also limit the tuneup to specific pages on your site. TR Design can also conduct a more comprehensive review of your brand. This review focuses on both the messaging and design aspects of your brand and includes an audit of your marketing materials, interviews with key people to gain a better understanding of the brand, and a competitive analysis. If you’re interested in a comprehensive brand review, please contact us for more information. The report you receive at the conclusion of your Tuneup will indicate areas identified for improvement and include recommendations to better clarify your position, simplify your message, and improve the overall effectiveness of your website. In addition, the report will highlight areas of concern, such as confusing content, questions that need to be answered, or issues that require further discussion before content can be finalized. 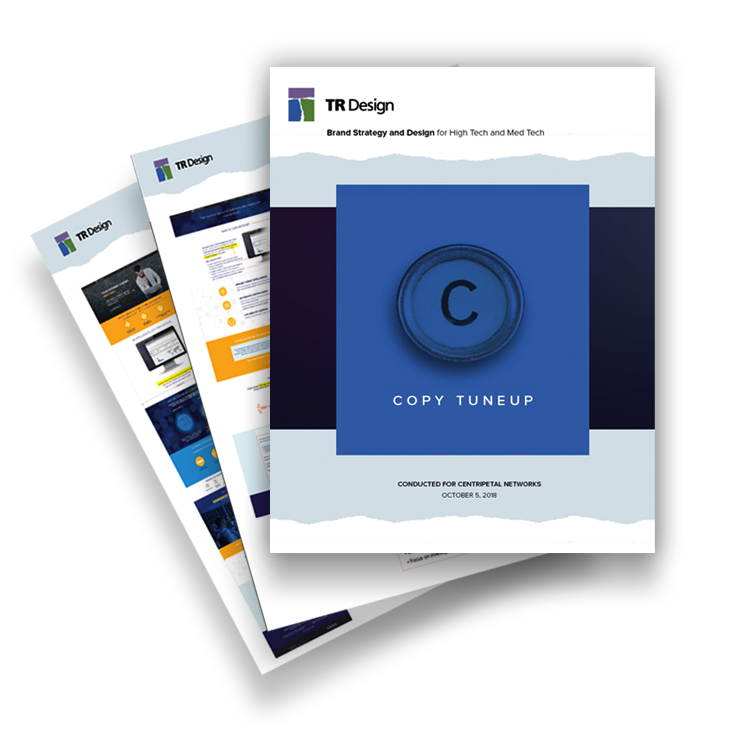 To get a better idea of how it works, check out samples from a Copy Tuneup report. Why work with an outside firm? Developing web content for technology products can be difficult. The more immersed you are in it, the easier it can be to slip into industry or internal jargon. It can also be harder to develop content that’s easily understood by someone unfamiliar with your product, or with a less technical background. As a design firm focused specifically in the high tech and med tech markets, we understand technology and have the objectivity, industry expertise, and communication skills necessary to simplify these complex stories and engage visitors. How does a Website Tuneup work? Every Tuneup begins with a meeting to learn about your company and its products. Depending on which Tuneup is selected, TR Design will conduct a thorough review of the website (a standard Tuneup includes 10 pages). We will then deliver a report that will describe our recommendations to improve the clarity, consistency and functionality of your website. Implementing the changes — which can be performed by your web developer or by TR Design — is not included in the cost for a Tuneup. How much does a Website Tuneup cost? The standard cost for each type of Tuneup is based on a review of 10 web pages. Pages can be added to the Tuneup at an additional cost. Includes Tuneup report and recommended copy changes. Includes Tuneup report which includes analysis look and feel, graphics and animations. Creation of new visual elements are additional. SEO Tuneup: Contact us for pricing. Includes a review of all on-site and off-site factors that are affecting site performance. Can I get a more detailed explanation of what’s included in the report? Absolutely. Contact us below to set up a twenty-minute presentation.